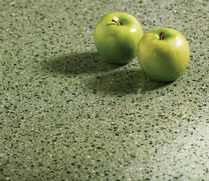 IceStone® is the green countertop surface for the 21st century, a compelling fusion of beauty, performance and sustainability. 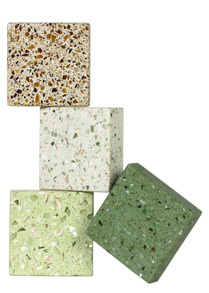 Made from 100% recycled glass in a concrete matrix, IceStone countertops harmonize classic and contemporary styles with environmentally responsible design. 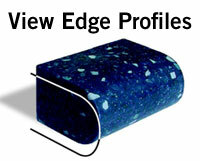 Is made from 100% recycled glass diverted from landfills and mixed with cement to create a durable, high-performance concrete surface. Is fabricated, installed and maintained like natural stone; it can be shaped, water jet cut, inlaid, and mounted vertically or horizontally. Isn’t petro-chemical based so it won’t fade with UV exposure. Is strong like granite, isn’t as porous as marble, and is heat-resistant. Doesn’t contain plastics, polyester resins, or volatile organic compounds (VOCs). Is 100% recyclable via mechanical grinding and reforming. Can provide up to 6 points for (LEED) projects. IceStone offers 27 beautiful shades that range from soft, earth-toned neutrals to rich, vibrant colors, but its color pallet is virtually infinite. IceStone surfaces can be made in almost any color by adding pigment to the background mix, and then selecting from a variety of sizes and colors of glass. IceStone is the first and only durable surface to achieve McDonough Braungart Design Chemistry (MBDC) Cradle to Cradle™ certification. This certification provides a tangible and credible measurable achievement in environmentally-intelligent design and manufacturing.